This is intended to be a complete list of properties and districts listed on the National Register of Historic Places in Queens County, New York. The locations of National Register properties and districts (at least for all showing latitude and longitude coordinates below) may be seen in a map by clicking on "Map of all coordinates". Four of the properties are further designated as U.S. National Historic Landmarks. (#16000038) 54th & 56th Aves. on 111th St.
(#05000229) Above 23rd St. bet. 44th Dr. and 45ht Rd. (#83001763) Roughly 64th Pl. from Catalpa Ave. to 68th Ave. from 64th St. to 65th St.
(#83001764) 60th Lane, 60th and 62nd Sts. bounded by St. Felix, Myrtle, and Cooper Aves. Ridgewood Limited to brick two-story rowhouses in the designated area. (#14000938) 82-10, 82-20 Queens Blvd. (#06000373) Roughly bounded by 29th Ave., 163rd St., 32nd Ave., 192nd St., 154th and 153rd Sts. (#83001761) Roughly bounded by Myrtle and 70th Ave., and 65th and 66th Sts. (#83001762) Roughly bounded by Fresh Pond Rd., Putnam, 68th, Forest, Catalpa, Onderdonk, and 71st Aves. (#02001357) 109-18 and 109-20 54th Ave.
(#83001766) Residential rowhouses on Cornelia St. and Putnam Ave, bounded by Jefferson St., Wyckoff, and Myrtle Aves. (#83001767) Roughly bounded by Linden and Cornelia Sts., Seneca and St. Nicholas Aves. (#05000937) Roughly bounded by Shore Rd., Marinette St., Douglas Rd. and Cherry St.
(#05000627) Beneath Broadway at 82nd St. and 45th Ave. and Elmhurst Ave.
(#13000499) Beach 24th, Beach 25th & Beach 26th Sts. (#04000706) Woodhaven Blvd. and Myrtle Ave.
(#83001769) Forest Ave. from Summerfield to Stephen St. and Norman St. to Myrtle Ave.
(#86000446) Totten and Murray Aves. (#83001770) Roughly bounded by Fresh Pond Rd., Traffic Ave., Woodbine and Linden Sts. Ridgewood Residential row houses on Linden, Gates, and Palmetto Aves. (#83001772) Fairview Ave., St. John's Rd., Linden and Grove Sts. (#73001251) Along 45th Ave., between 21st and 23rd Sts. (#99000059) Bounded by Roosevelt Ave., Broadway, Leverich St., Northern Blvd., and 90th St.
(#74001295) 150th St. and Jamaica Ave.
(#72000905) 37th St. and Parsons Blvd. (#02000301) Roughly Alley Pond and Cunningham Parks, bet. Winchester Blvd. and Clearview Expressway, bet. 73rd Ave. and Peck Ave.
(#83001777) Roughly bounded by Woodbine St., 60th Pl., 67th and Forest Aves. (#04001147) Near jct. of Roosevelt Ave. and Main St.
(#04000874) 83-15 Kew Gardens Rd. (#67000015) S side of Northern Blvd. (#78001897) 35th Ave., 35th, 36th, and 37th Sts. (#12000052) Bounded by Union Tpk., 150th St., Goethals Ave., Parsons Blvd., Grand Central Pkwy., & Main St.
(#01001438) 159th St. and Beaver Rd. (#13001155) 90-01 Beach Channel Dr.
(#86002678) 1324 Beach 12 St.
Far Rockaway Church designed by Ralph Adams Cram with Louis Tiffany windows, recently restored. (#83001778) Roughly Seneca Ave. E. between Hancock and Summerfield Sts. (#83001779) Roughly bounded by Woodward, Seneca, Catalpa Aves., and Woodbine St.
(#83004618) Roughly DeKalb and Woodward Aves., Stockholm and Hart Sts. (#83001781) 59-12 to 59-48 Summerfield St.
(#84002919) Roughly bounded by Queens Blvd., 43rd and 52nd Sts. Barnett and Skillman Aves. (#13001156) 1-88 Beach 84th St.
(#83001783) Roughly bounded by Forest and Fairview Aves., Woodbine and Linden Sts. Woodhaven Located behind St. Matthew's Episcopal Church (see above) and not clearly visible from the street. 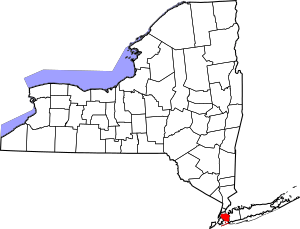 National Register of Historic Places listings in Queens County, New York Facts for Kids. Kiddle Encyclopedia.